The ushers’ rule prohibiting flash photography did not stop the audience from snapping pictures of Shakira as she appeared on stage to accept the 2011 Artist of the Year award at Sanders Theatre on Saturday. The Harvard Foundation presented the award to Shakira, a Colombian-born singer, songwriter, and philanthropist, in conjunction with its 26th annual Cultural Rhythms festival, a performance that showcases a variety of performance groups on campus. The foundation recognized Shakira, born Shakira Isabel Mebarak Ripoll, for her contribution to music as well as her humanitarian work with the Barefoot Foundation, whose mission is to promote a better quality of life for children in impoverished areas through education and nutrition. The award is given annually to artists, scientists, and leaders in honor of outstanding humanitarian work, according to the foundation’s website. Cultural Rhythms aims to promote intercultural awareness through student performances and ethnic cuisine. The afternoon show included a surprise visit by Howard G. Buffett—the son of the investor Warren E. Buffett. The younger Buffett has collaborated with Shakira in the past on philanthropic work. Dean of Admissions and Financial Aid William R. Fitzsimmons ’67 described Shakira as an “ideal Harvard student” based on her musical talent and dedication to humanitarian efforts. “I hope you will think of her as a role model,” he said. The sold-out afternoon show on Saturday started 30 minutes behind schedule as an anxious audience waited in the packed Sanders Theatre. When the lights began to dim, people cheered and shouted as the foundation’s director, S. Allen Counter, welcomed Shakira on stage. Throughout the show, Shakira sat on the side of the stage and interacted with representatives from each group after their performances. The afternoon show featured performances by groups ranging from the Asian American Dance Troupe to the Mariachi Veritas. Nikita N. Jambulingam ’13, who bought a ticket to the show shortly after Shakira was revealed as this year’s guest of honor, said she would have paid the same amount to see the show even if Shakira wasn’t there. “The show is hyped up because of Shakira, but it should be hyped up because of the Harvard performers,” Jambulingam said. 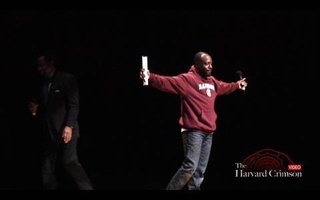 The afternoon show was followed by a food festival at the Science Center and an evening show at Sanders Theatre, which highlighted performances by additional cultural groups, such as Harvard Syncopation, a step dance team, and Under Construction, an a capella group. Shakira, a Grammy Award-winning musician who has sold close to 50 million albums worldwide and whose hit song “Hips Don’t Lie” is the biggest selling single of the 21st Century, recorded the theme song for the 2010 World Cup in South Africa. That song—“Waka Waka (This Time for Africa)” was the best-selling World Cup theme song ever. Previous recipients of the award have included Will Smith, Matt Damon, Halle Berry, Jackie Chan, and Wyclef Jean. According to its website, the mission of the Harvard Foundation for Intercultural and Race Relations is to “improve relations among racial and ethnic groups within the University and to enhance the quality of our common life. —Staff writer Jane Seo can be reached at janeseo@college.harvard.edu. Rather than being in the news for huge drops in its endowment, Harvard could be in the news for finding a new way to deliver supplies to disaster stricken areas. A team of researchers from Harvard is collaborating with Google and George Clooney to implement a monitoring system that will watch for violence in southern Sudan. The U.S. government should start taking the welfare of people abroad more seriously across the board. Celebrities should not make up the bulk of award recipients.